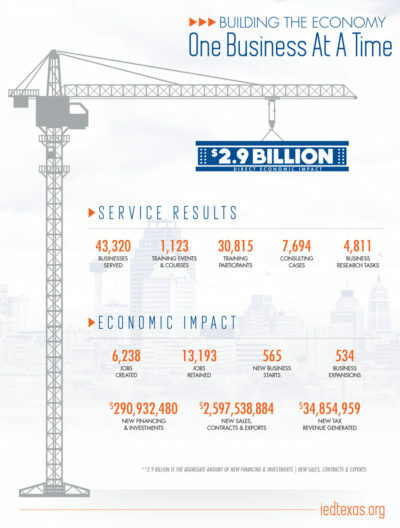 SAN ANTONIO, Feb. 28, 2019 – Through business advising to more than 43,000 business and community clients, the UTSA Institute for Economic Development generated $2.9 billion in direct economic impact nationwide, according to its newly released 2018 annual report. Of those who received advising, training and business research assistance, over 1000 businesses were started or experienced significant growth, resulting in the creation or retention nearly 20,000 jobs. These businesses generated $291 million in new financing and $35 million in new tax revenue, with new sales, contracts and exports valued at $2.6 billion dollars. Comprised of nine centers, the Institute provides professional business advising, technical training, research, market analysis, and strategic planning for entrepreneurs, business owners and community leaders to strengthen economies locally, nationally and internationally. It also leads the expansion of the Small Business Network of the Americas. This international initiative has guided 22 western countries to adopt the UTSA Small Business Development Center methodology, which has evolved over 35 years at 1,100 universities and colleges across the nation. Today, nearly 250 centers operate in Central America, Latin America and the Caribbean. They have collectively advanced more than 51,000 entrepreneurial projects. Chile and Colombia lead the adaptation process with 51 and 117 Centers, respectively. With a mission to promote science and technology-based innovation, the UTSA SBDC Technology Commercialization Center (TCC) guided 88 clients through the commercialization pathway in 2018, moving each client closer to taking their innovation to market. In 2018, the South-West Texas Border SBDC earned accreditation from America’s SBDC with a special designation for their efforts in assisting small business clients with the commercialization of their STEM-based technology. The Institute is committed to creating jobs, growing businesses and fostering economic and community development. With an emphasis on scale-up growth industry clusters and technology commercialization, the Institute’s core strengths include business start-up, manufacturing competitiveness, high-growth minority businesses, international trade and investment, government contracting and corporate supply chains, rural development, applied economics and development policy research, and shale energy economic research. “2018 was a remarkable year for the Institute. We are immensely proud of our accomplishments and reaching this significant milestone of our strongest year to date. Our motto, ‘building the economy one business at a time’, impacts local and international audiences, and we look forward to continuing to being a leading force for economic growth in 2019 and beyond,” said the institute’s interim director Al Salgado. The Institute resides at the UTSA Downtown campus and is an integral part of UTSA’s experiential learning mission. Hosting an average of 40 undergraduates, graduate students and alumni each year, these workforce-ready professionals have gone on to secure employment with J.P. Morgan Chase, Marathon Oil, the U.S. Air Force, the Asociacion de Empresarios Mexicanos (AEM), Proctor & Gamble, the U.S. Bureau of Economic Analysis, and other top organizations.